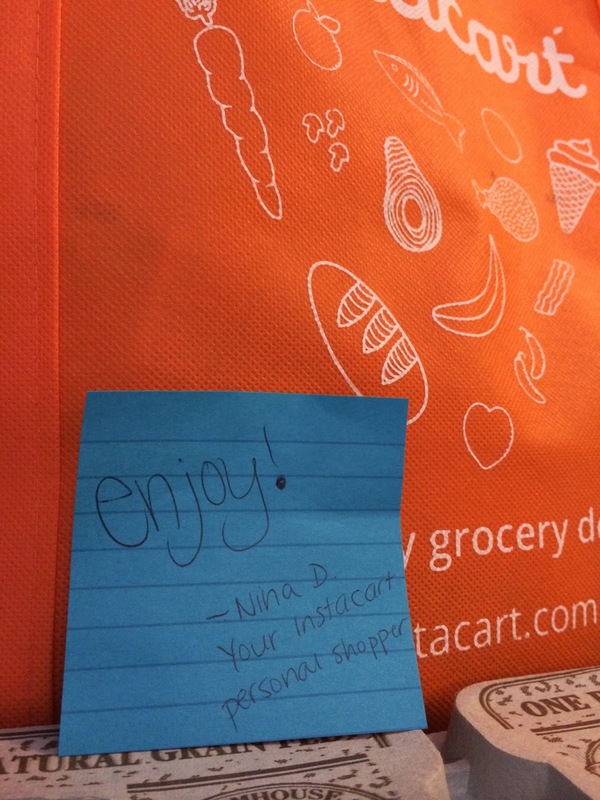 Instacart Launches, an early review & a Discount for you guys! 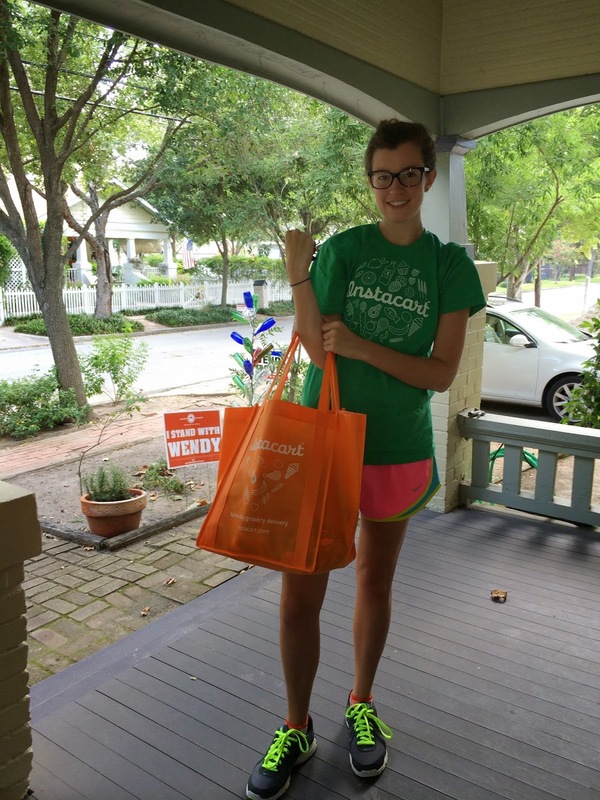 Instacart (www.Instacart.com), the only service that can deliver groceries from multiple local stores within an hour, launched Houston’s first one-hour grocery delivery service today. You probably read about it here, and here, or saw the story here. Starting today, Instacart customers in Houston can order groceries from both Whole Foods Market and H-E-B. Additional stores will be added in the coming weeks, and customers can combine items from multiple stores into one order. All this and it will be delivered to your door. "Originally launched in San Francisco and since expanded into many other major cities, Instacart has disrupted the traditional grocery delivery space with its crowdsourced labor force dubbed "Personal Shoppers" who shop for and deliver grocery orders providing their own transportation in as little as one hour. This eliminates the need for costly infrastructure such as inventory, warehouses, trucks and full-time drivers." It kind of reminds me of Uber, but with groceries. Instacart will initially serve the areas of downtown Houston and inside the loop, west of downtown, including the neighborhoods of Montrose, The Heights, River Oaks, West U, Rice Military, Memorial Park, The Galleria, Bellaire, Briargrove, Memorial Villages, Midtown, Washington Ave, Upper Kirby and the Museum District. A map of Instacart’s coverage areas can be found at www.instacart.com/locations. Houston customers who order TODAY August 27 will receive a free month of deliveries. While Houston City Launcher Matt O’Connor is looking at "the proportion of young professionals who work long hours is very high in Houston and we expect the convenience of Instacart for grocery delivery to resonate with them," I also see tons of families with two working parents in the Hieghts. I think those people are ready, willing, and able to pay for this convenience as it means one less errand and more time together. Customers can open an account at www.Instacart.com, and get free delivery on their first order of $10 or more. Instacart also offers an Amazon-Prime like service called Instacart Express -- an annual membership that eliminates delivery fees for all orders of $35 or more. The cost is just $99. Customers can sign up for a free two-week trial at www.instacart.com/express. 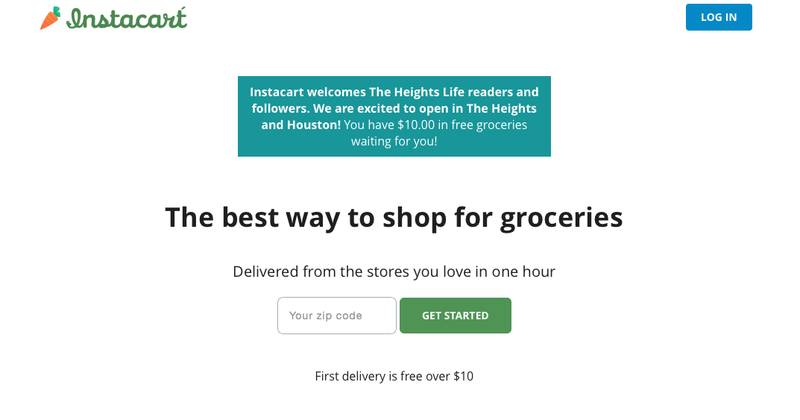 They have also offered an exclusive $10 off free grocery promotion code for The Heights Life readers and followers: HEIGHTSLIFE Also, if you order TODAY (Sept 27, launch day) you get a month of Express service for free. Today was about convenience. I needed to get to work on a project, so knew I’d be at my desk and could wait for a delivery. I used my desktop computer to shop, not the app. Creating your order is fairly easy. It helps to know the brand name—searching “Bob’s Red Mill Oat” got me the oatmeal I wanted. I didn’t try to order anything that required a special description. I did order one produce item I’m fussy about—bell peppers. I wanted to see what I’d get. At check-out, it showed the list of recommended substitutions for each item, and I had three options: yes, swap it for the recommended one; yes, but substitute a different item than the one suggested (and then I could search to find my preferred sub); or, don’t get a substitute if what I want isn’t available. You should hover over the suggested substitute to check the price and avoid surprises– the $3.49 hummus had a $7+ recommended substitute, which I declined to accept because I could make a gallon of hummus for that much money. The prices were a bit higher, which is how the delivery fee stays low, for sure. Today, I was willing to pay for the convenience. I’d want to check to see just how much higher, and I wonder if the company pass along any special store pricing, or if they buy at the sale price but sell to the user at the regular one. I placed my order at 10:41. The shopper called from the store to double-check the substitutions. Online, I only had the option to select organic cauliflower; she wanted to be sure I would be OK with conventionally-grown. I got a text at 11:13 saying my order was on the way, with an estimated delivery time of 11:50. The actual delivery was at 11:35ish. By 11:44, I had a text from Instacart allowing me to rate the experience. The peppers passed my inspection. The eggs arrives safely, too. 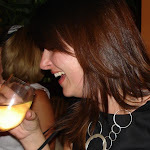 I’d do it again, especially if I were ordering my staples and cleaning supplies. I wonder if the app allows you to scan barcodes to create a favorites list?